The truth is, all of us have already read The Voyage of the Dawn Treader many, many times, so we really didn’t need our memories refreshed. But we were glad of an excuse to read it again for “Reading and Refreshments,” as it is probably our favourite of the Narnian chronicles. How could you not love a story with such a clever opening? Pure brilliance, isn’t it? With that one witty sentence, Lewis gives us a clear-cut picture of Eustace’s character. The book only keeps on getting better from there, as Lucy, Edmund, and Eustace are drawn through a picture onto a Narnian ship led by Lucy and Edmund’s old friend Prince Caspian. Caspian is sailing out in his royal ship the Dawn Treader towards the Lone Isles, in search of seven missing lords. But that is only the beginning of the journey, they intend to sail on in quest of the most exciting of destinations . . .
“That is my main intention [said Caspian]. But Reepicheep here has an even higher hope.” Everyone’s eyes turned to the Mouse. “As high as my spirit,” it said. “Though perhaps as small as my stature. Why should we not come to the very eastern end of the world? And what might we find there? I expect to find Aslan’s own county. It is always from the east, across the sea, that the great Lion comes to us. I won’t tell you whether they do reach it in the end or not, but I can tell you that they find more than their share of wondrous adventures. And it is in this theme of voyage and discovery, I believe, wherein lies the particular charm of this Narnian chronicle. And of course they run into all kinds of fantastic creatures and interesting characters—including one whom they turn out to already know quite well . . . He had turned into a dragon while he was asleep. Sleeping on a dragon’s hoard with greedy, dragonish thoughts in his heart, he had become a dragon himself . . .
And Eustace nodded his terrible dragon head and thumped his tail in the sea and everyone skipped back . . . to avoid the enormous and boiling tears which flowed from his eyes. Of course, it turns out all right; Eustace becomes “undragoned” in one of the most beautiful passages of the book and becomes a reformed character—sort of. It would be nice, and fairly nearly true, to say that ‘from that time forth Eustace was a different boy.’ To be strictly accurate, he began to be a different boy. He had relapses. There were still many days when he could be very tiresome. But most of those I shall not notice. The cure had begun. Oddly enough, considering the amount of feasting that goes in The Voyage of the Dawn Treader, we had an dreadful time finding an appropriate dish (roast goat, cold peacock, mead, and mulled wine being out of the question, and mushroom soup not being considered enough of a “treat”) to make for the refreshments. Thankfully, Lucy’s meal with the magician on the island of the Dufflepuds provided some viable options . . . The table was bare when they entered, but it was of course a magic table, and at a word from the old man the tablecloth, silver, plates, glasses, and food appeared. “It’s lovely,” said Lucy, and so it was; an omelette, piping hot, cold lamb and green peas, a strawberry ice, lemon-squash to drink with the meal and a cup of chocolate to follow. 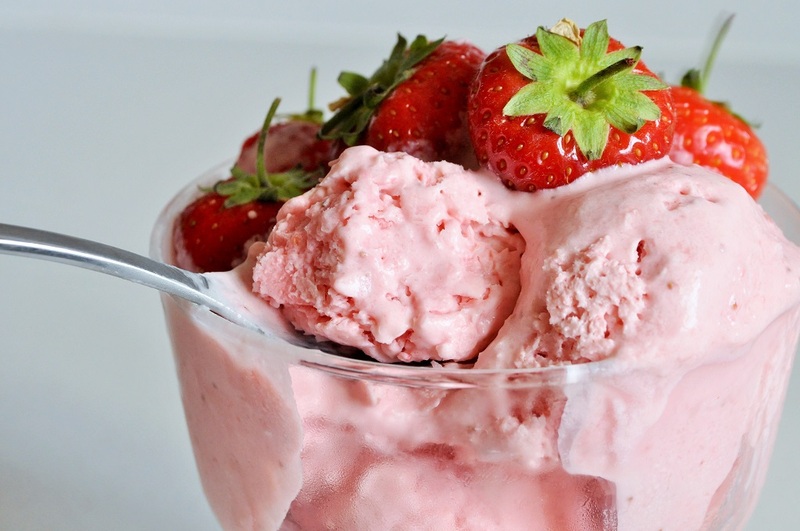 We decided on strawberry ice, naturally. What could be more refreshing than that? 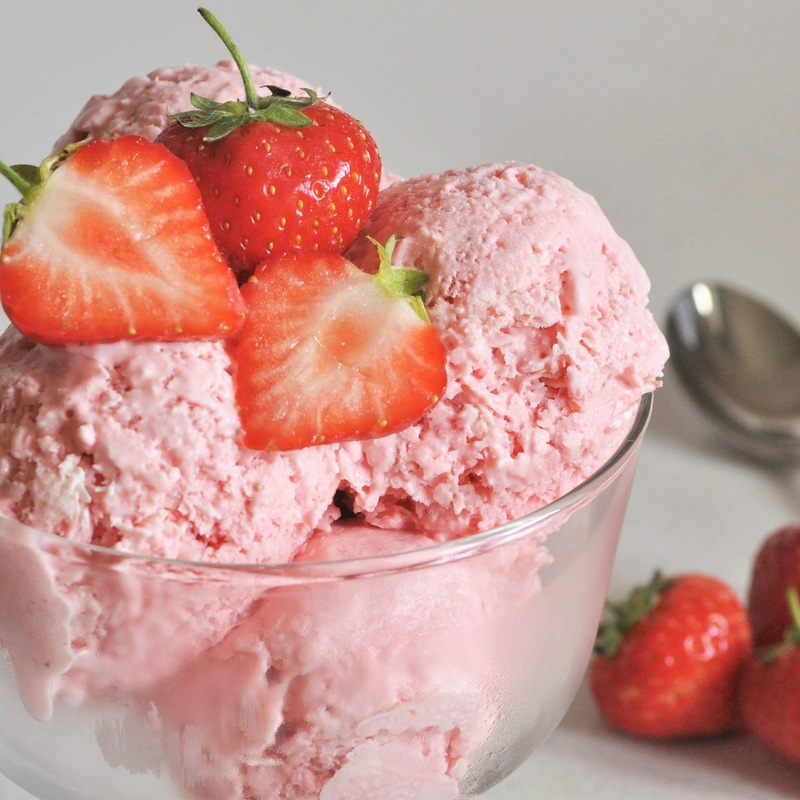 And ice cream always has a sparkle of magic about it that makes it well-suited to pairing with this magical tale. If you decide to hold your own “Reading and Refreshments,” please let us hear about it! Tell us how your family enjoyed the book and whether or not you made ice cream to go with it. If you can, send us a photograph as well. You can contact us at thesiblingwritery@hotmail.com. The next installment of “Reading and Refreshments” will be coming out in November. Read and enjoy! Puree the strawberries, sugar, lemon zest, juice, and yoghurt in a blender until smooth. In the bowl of a stand mixer fitted with the whisk attachment, whip the cream until it holds soft peaks. Using a rubber spatula, fold the whipped cream into the strawberry-yoghurt mixture, just until no streaks of white remain. Pour into a freezer-safe container and place in the freezer. Chill for six hours or overnight, until firm. 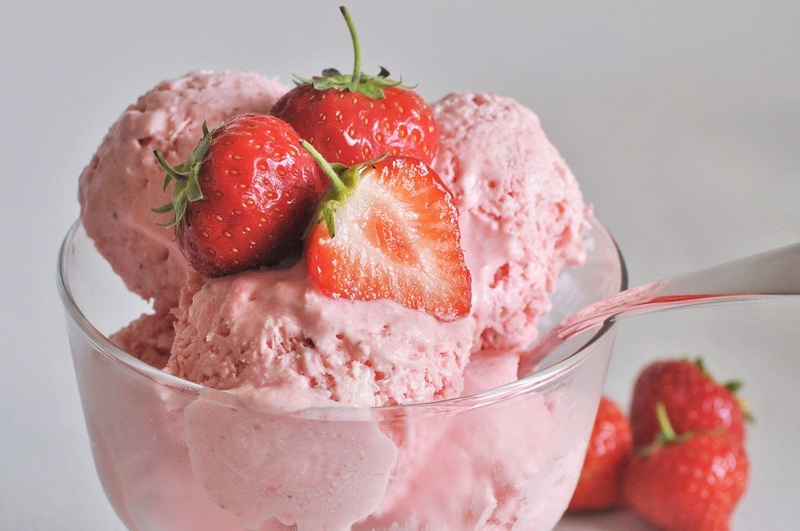 If you prefer a creamier texture, like machine-made ice cream, take the mixture out of the freezer every hour, and break it up and stir it briskly with a fork to crush up the ice crystals. 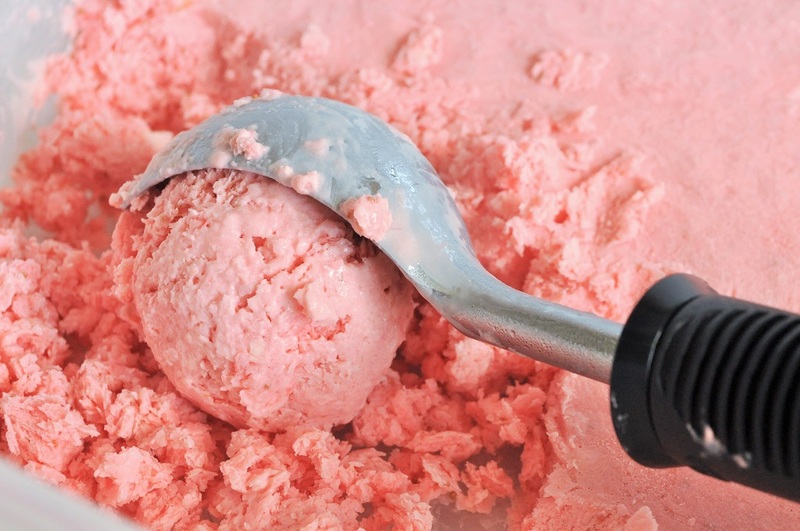 If you’re freezing the ice cream overnight, or simply don’t want to bother with stirring every hour, the mixture will freeze up quite hard and solid. So, when you want to serve it, let it thaw on the counter for 15 minutes or so, and then break it up and mash it about with a fork a little before scooping it. It will be a little icier than store-bought ice cream, but the flavour is so much better that I don’t think you will care.